Feathercraft is excited to be taking part in this year's Bay Area Paddlefest. The exhibition will take place on April 21st and 22nd at the Quarry Lakes Regional Recreation Area in Fremont, California. 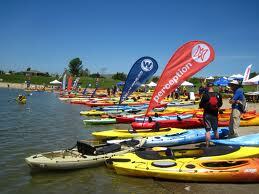 The paddlefest is California's Largest Paddlesports Expo, showcasing the newest paddleboard, canoe and kayak designs. It is an opportunity for paddle enthusiasts to meet the makers of their watercrafts, talk about their sport with other enthusiasts and partake in clinics with pro and semi-pro paddlers. Courses range from introductory on land seminars to master class stand-up paddleboarding classes. Families are encouraged to partake in the 'Craft For Kids - Get Yours Kids Afloat' seminar, where a variety of demos will be held for parents looking to get their children involved in paddlesports. The cost is relatively cheap, with a Demo Only Day Pass running $15 US. For a Classes Day Pass, you will need to spend an additional $15. The gates to the beach grounds open at 9 am and close at 4 pm.